On a fantastic spring day more than 160 people turned out to explore the great wilderness surrounding Castle Hill Village. The Canterbury Rogaine Series returned in mid-October with two course lengths, a 6-hour and a 3-hour, catering for a range of skills and fitness levels. 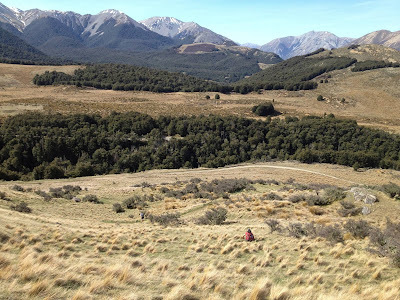 The terrain across the course was varied with many riverbeds, tussock hillsides, native bush, and scree slopes to explore. Many teams made use of the Hogs Back track for fast travel between some of the checkpoints. Alistair Cory-Wright won the 3-hour event convincingly with 1280 points, despite a sizeable late penalty. The Lost Boys were second overall with 1120 points, also being the first of a strong contingent of junior teams, taking 3 of the top 5 places. There was also a very strong showing of school students, particularly in the 3-hour event. It is always good to see the next generation of local rogainers showing enthusiasm for the sport. Top performers in the 6-hour event were Matt Scott and Lara Prince, who were also the first mixed team, and collected an impressive 2380 points. Second place went to Michael Smithson and Ian Forne on 2220 points. To complete the top three was the first woman’s team of Katie Bolt and Emily Wall on 2050 points. The event was held as a fundraiser for New Zealand’s newest youth adventure racing team who are busily training for the GODZone Adventure Race to be held near Kaikoura in March. Tim Farrant and Elisha Nuttall are both keen rogainers and hope their navigation skills will keep the team on track for this multi-day race. Already the team are planning their next rogaine, a special Waitangi themed event to be held in the Christchurch Port Hills on 6 February 2014. Thank you to all competitors for taking part and to Bivouac Outdoor for their fantastic support. See you all next time!